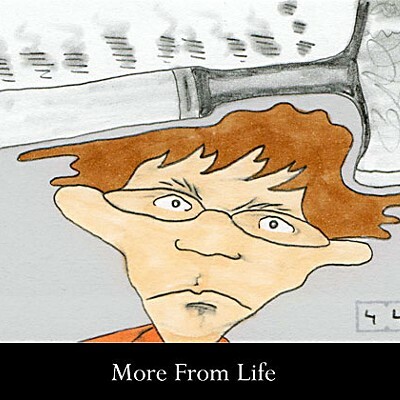 Fans of Humboldt artists Stephen Vander Meer and Jim McVicker can now delve deeper into their respective worlds through two new films: More From Life a film by Vander Meer, and Jim McVicker, a way of seeing, created by Petter Granrud and John Crater. Well known for his Los Bagels "Clothed Tuesday" design, probably better known for his fine art rubber stamps and StewArt Studios presence, Vander Meer is also a maker of animated short films. More From Life is his third. His first, Arcata Brain Closet, screened at several festivals after its 1988 completion, winning awards along the way and also showing at both San Francisco's de Young Museum and the New York Museum of Modern Art. 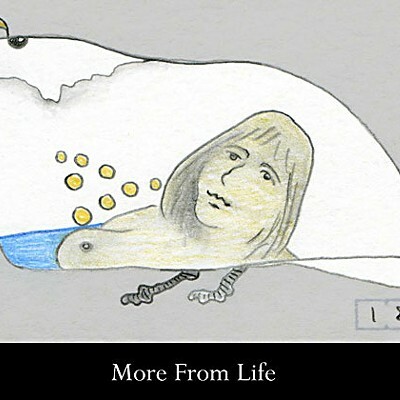 Like Arcata Brain Closet, More From Life clocks in at about nine minutes and features music by Howie Kaufman. But where his earlier work tells 26 alphabet-based stories ("Arcata Brain Closet" ... "ABC" ... get it? ), the narrative of More From Life flows between reality and imagination, creating a constantly changing dreamscape. Vander Meer habitually keeps what he refers to as "a visual diary" of tiny drawings, "no larger than a square on a very small calendar." 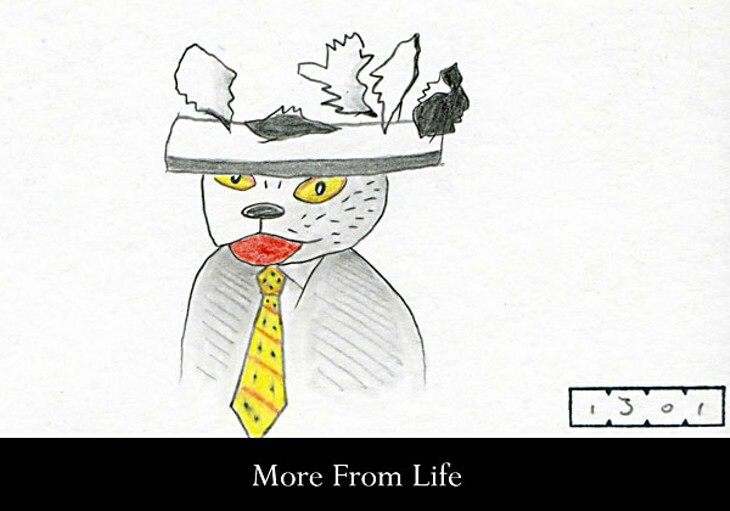 Throughout 2007, he expanded to using index cards and drawing specifically from life. Each day, he'd find a subject, sometimes ordinary, sometimes monumental. 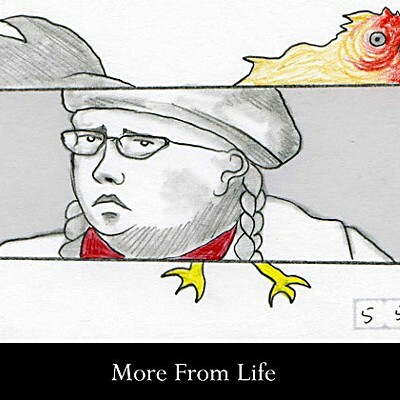 About eight months in, he began working on the "tweens," the drawings that connect the daily life drawings to each other. Add those, plus each month's title card and the final drawing count totals 6,017 over two years. Admittedly, the technical detail -- "How did he do that?' 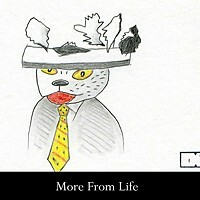 -- is more interesting after watching More From Life. As the film unfolds the pleasure comes from watching the subjects morph one into another, especially since Vander Meer's keen eye for a sensual line is evident from the start. Years of life drawing groups show up in the form of various nudes, an ice cream cone separating so that the scoop becomes a head and the cone shifts into the nether regions of a female model -- and then that becomes an apple, a cat, a self-portrait. Part of the charm is in watching what comes next in this animated sketchbook. Vander Meer calls More From Life "visual music, a celebration of the mundane ephemera of daily life and how, in one's memory, these things run together, overlap and morph into each other." In this case, they do so beautifully. See for yourself by watching the trailer at meerimage.com/animation. People recognize and admire the paintings of Jim McVicker to such an extent that hearing him referred to as "Humboldt County's best known and most successful artist" is a common occurrence. In addition to his reputation as a masterful painter, McVicker's also commonly known as a quiet and modest sort of guy. In Jim McVicker: a way of seeing, not only do we get to view the North Coast through McVicker's eyes, but we get to hear the man himself -- quietly, modestly -- talk about what he does. Made by Norwegian filmmaker Peter Granrud, the documentary follows McVicker around a spectacularly lit Humboldt County. From the start, viewers witness the landscape aglow in that so-called magic light that happens when the sun's slant makes deeper shadows, adds sparkly highlights, gives such a quality to the air that an observer pauses to revel in the world's beauty. Of course, not everyone is a keen observer -- that's why artists are so important. They show us what we might miss, or forget about, or never even knew existed. By showing us landscapes as if through his eyes, the filmmakers illustrate the connection between the way McVicker sees and how he paints. Further, they allow us to see that way as well, even if we can't immortalize such moments through the application of paint to canvas. In interviews with McVicker's friends and fellow artists -- as well as his wife, Terry Oats, a phenomenal painter herself -- his unique "way of seeing" is referenced again and again. McVicker affirms this. "I've had people pull off, see me painting and wonder, 'What do you see out there, what are you painting?' and then they look at the painting and then they look at the scene and it clicks. I think that's what the artist does ... for most people it's just a jumble, a visual assault ... they aren't able to zero in on the beauty of it." While the narration strays into too-serious mode at times, overall ...a way of seeing works, both for showing the relationship between McVicker and the places he loves, and as a look at one master's process. Because he eschews painting from photographs, he can't work on the same landscape painting for more than a few hours at a time. Sometimes he'll return to a spot 10, even 20 times, before a canvas is complete. He admits to "incredible frustration" at times, but says the real-life experience -- and corresponding real-life passion -- makes for better work. Unlike some painters, McVicker does not alter the composition as it exists in the outside world to better fit preordained classic art parameters. Instead, he excels at finding that which already serves to absorb a viewer -- tribute, again, to his "way of seeing." He's able to transcend such boundaries even further, as the film shows in a scene where McVicker's painting at the docks. The swoop of the ships' bows lead to an orange buoy almost centered on the canvas -- a prime no-no in the composition world. Artists are not supposed to have subject matter directly in the middle because an onlooker's eyes are then drawn just to the center instead of flowing over the entirety of the painting. But McVicker gets away with this through a combination of talent and understanding. He's used to treating the canvas as a whole, framing the scene so that all parts captivate the viewer -- the same way McVicker himself is enthralled by the vista before him. Jim McVicker: a way of seeing is available, free of charge through jimmcvickerpaints.com. Yet another Humboldt household name -- you've heard of Duane Flatmo, perhaps? -- is showing up in another medium, this one a book about California murals. Large Art in Small Places by art historian Kevin Bruce, recently published by Ten Speed Press, features more than 20 Humboldt County murals in Eureka, Arcata and Ferndale. Eureka Books hosted Flatmo and Augustus Clark at last week's Arts Alive! event. For more information, visit the bookstore at 426 Second St. or eurekabooksellers.com.